A new Fiat 500 crossover, called the Fiat 500X will make its debut sometime in early 2014. The Fiat 500X is an all wheel drive variant, based on the the chassis used by the upcoming Fiat 500L. 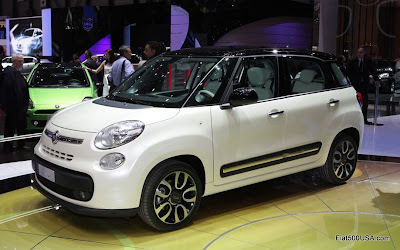 The Fiat 500L is a much larger car than the Fiat 500 (162.9 versus 139.6 inches) and uses the all wheel drive capable, widened chassis of the Fiat Punto and Alfa Romeo MiTo models. There are no images of the Fiat 500X, but it is said to be larger than the Fiat 500L at approximately 165.4 inches. The new Fiat 500X Crossover uses the chassis of the Fiat 500L. Currently there are no images of the Fiat 500X. 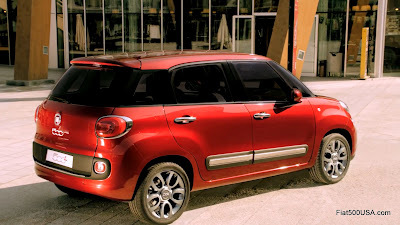 Readers of this blog will not be surprised by this as I have discussed the all wheel drive capabilities of this chassis in a few posts last year (Fiat Models That May be Coming to the US and Future Fiat 500L Spotted). The Fiat 500X crossover will replace the Fiat Sedici, a small crossover that Fiat sells in Europe. 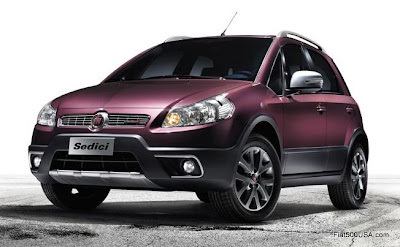 The Fiat Sedici is a joint venture with Suzuki, and folks in North America will recognize the car as the Suzuki SX4. The new Fiat 500X will be built along with a new Jeep model, code-named B-SUV, at Fiat's Mirafiore plant in Torino. * The B-SUV will be smaller than the Jeep Compass and Patriot, and will be sold in the United States, Europe and other markets. 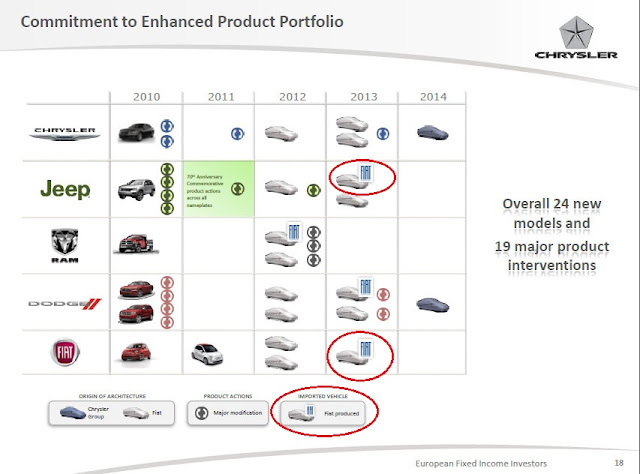 This product slide from Fiat shows the new small Jeep was to begin production in 2013. Latest reports are that it will be delayed to the second quarter of 2014. 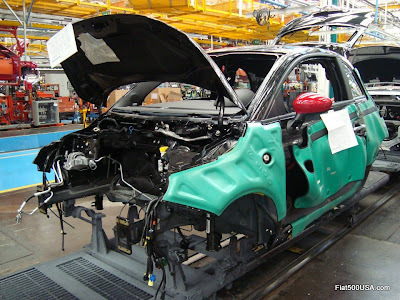 The Fiat 500X production is rumored to begin at the end of 2013 ahead of Jeep production in the second quarter of 2014. 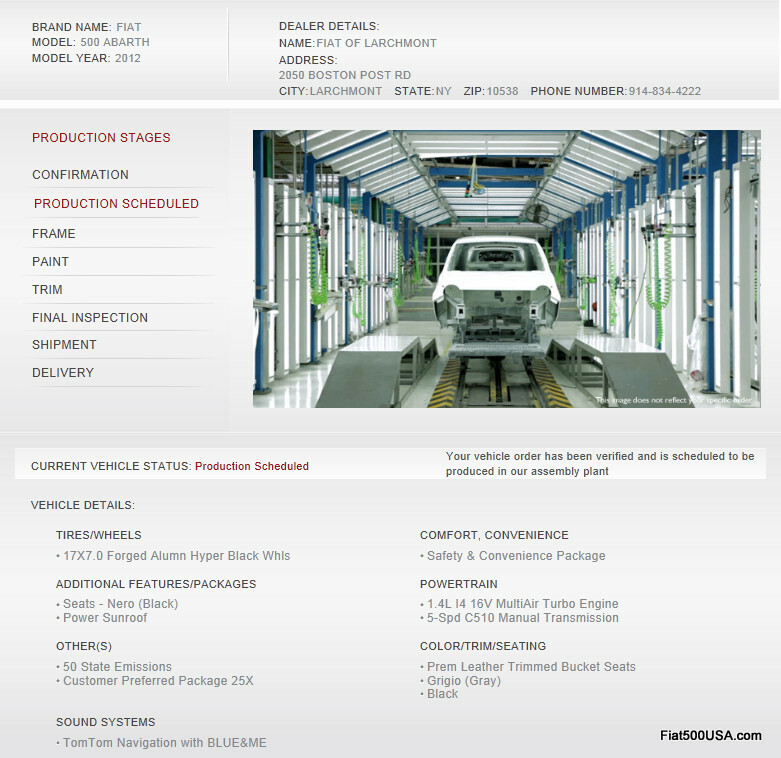 If this is true, that means the small Jeep will have been delayed a year since plans were first published in June 2010. When the Fiat 500X crossover shows up at North American Fiat Studios in 2014, it will join a very full range of cars: The Fiat 500, the 500c Cabrio, the 500EX electric car, the Fiat 500 Abarth and the Fiat 500L. Looks like Fiat Studios will be a very busy place. 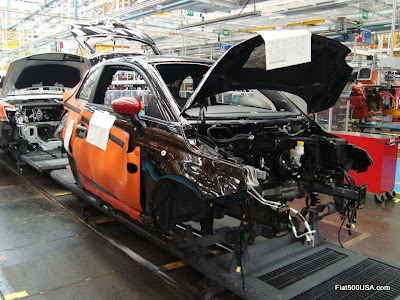 *Update 7/2013: Fiat has shifted the manufacturing of the two crossovers to its Melfi plant in central Italy. Production time frames have also been changed, with the Fiat 500X following a few months after Jeep production, which is scheduled to kick off June 2014. 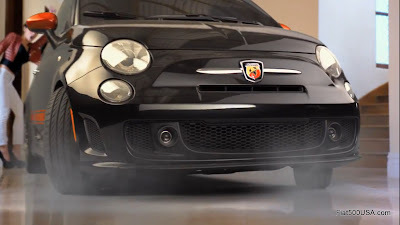 When you own a 2012 Fiat 500 Abarth, driving to work will never be the same. Why? Because the Fiat 500 Abarth has a split personality. On work days, it commutes with the best of them, in comfort and style, albeit with a healthy dose of attitude. On the weekends, look out, the Fiat 500 Abarth is a competitive track car that loves club day events at your local race track. 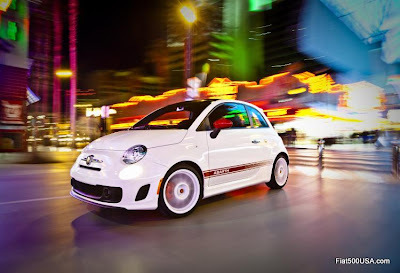 To kick off the Abarth Driving Experience program, FIAT USA has a contest going on right now on their Facebook page giving away an all-expenses paid weekend in Las Vegas learning how to drive the Fiat 500 Abarth from professional race drivers. Abarth driving dynamics will be demonstrated, and race skills taught, along with autocross techniques. After the expert training; Facebook fans, professional drivers, and bloggers will team together to compete in a fun series of challenges. 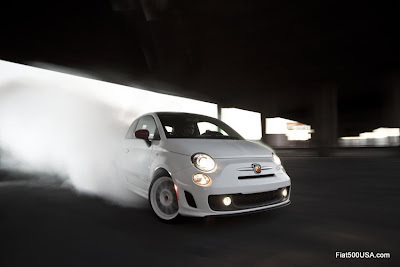 The ABARTH WANTS YOU – FIAT 500 ABARTH DRIVING EXPERIENCE contest ends April 2, 2012 at 11:59:59 PM ET, so go to FIAT USA's Facebook page to read all the details and sign up. This is a once in a lifetime opportunity, don't miss it! The special Fiat 500 Abarth Venom prototype was unveiled to journalists earlier this month during the Fiat 500 Abarth media event. This heavily customized Fiat 500 Abarth showcases what an Abarth owner can do with the full range of Magneti Marelli aftermarket accessories. These soon to be available parts include: carbon fiber trim, lowering kits, light alloy rims, boost controllers, turbo blow-off valves, unique leather interiors, and custom handmade exhaust systems just to name a few. The Fiat 500 Abarth Venom features an engine that is boosted to over 200 HP and weighs in a little over 2,000 lbs. Upgraded brakes and a suspension that is lowered 2 plus inches help in containing all this power. According to the Italian Magneti Marelli engineer I talked with, the performance is 'quite nice', which I took as a suave way of saying unfreakin' believable. Magneti Marelli supplies the original suspension, exhaust, lighting, instruments and fuel injection system for the European Fiat 500 and 500 Abarth. In addition, through its aftermarket division, Magneti Marelli supplies parts for the racing 500 Abarth Asseto Corse and a host of other performance parts and accessories. 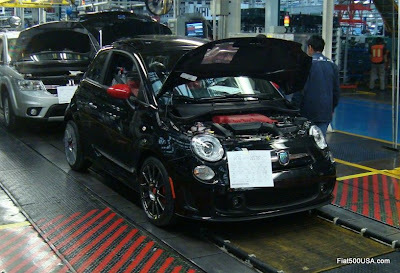 Now that the Fiat 500 Abarth is here, and the regular Fiat 500 sales are in full swing, Fiat USA is tapping Marelli's wealth of knowledge and parts bins. It is important to note that the Fiat 500 Abarth Venom is not a model that will be produced, but showcases accessories for the Fiat 500 and 500 Abarth models that should be available within the upcoming months at your local Fiat Studio. Some of these parts will need to be tweaked for US consumption, but FIAT USA has given the go ahead to bring a variety of accessories over to the US for distribution through MOPAR channels. Fiat 500 and 500 Abarth accessories will be added over the coming months and expect to see the bulk of them by this June. 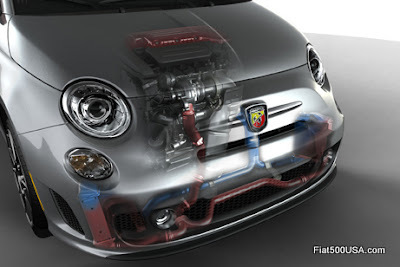 Magneti Marelli carbon fiber lower grill insert and lip spoiler for the Fiat 500 Abarth. 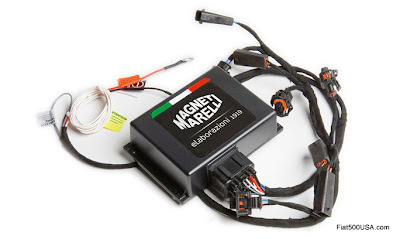 The Fiat 500 Abarth Magneti Marelli Boost Controller is fully plug and play, with OEM connectors (which makes sense because they supply the original electronic engine control units in Europe). It integrates into the electronic control system and increases horsepower and engine response. 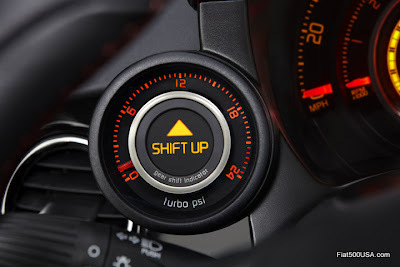 There are safeguards built in as the Boost Controller monitors engine sensors and will reduce power in certain situations, for example; if the engine should overheat. 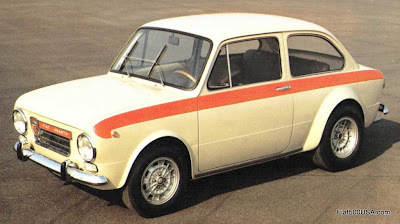 This image is of the European version which adds approximately 27 HP to the 500 Abarth. The US version is still under wraps. It is activated only after the engine has reached operating temperature. Deactivates in case of abnormal and prolonged elevated engine temperatures and overheating. Uses gold-plated pins in electrical connectors for zero current leakage. One US company that already has stocks of Magneti Marelli products available for the Fiat 500 and Fiat 500 Abarth is 500 Madness. They have been a Magneti Marelli dealer before the 500 was even available here in the US and have expertise on what fits and what doesn't. Make sure you check out their site. 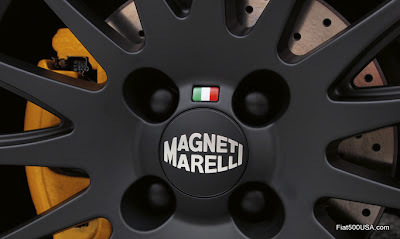 Magneti Marelli is well known in the racing world and supplies parts and electronics to Formula 1 and World Rally Championship racing teams from all over the world. With 2011 revenues of $7.8 billion and approximately 35,000 employees, Magneti Marelli has a reputation for producing advanced automotive systems and components. The company has 77 production facilities, 11 research and development centers, and 26 application centers in 18 countries. Products include lighting components, electronic engine control units, instrument panel, suspension systems and shock absorbers, exhaust systems, and plastic components (bumpers and tank). 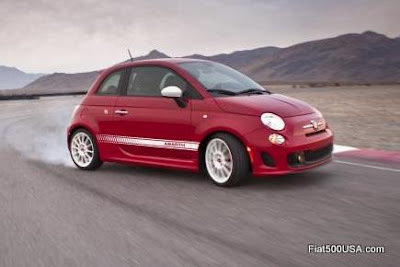 The 2012 Fiat 500 Abarth uses a Garrett GT1446 tubocharger, the same turbo that is used in the Abarth R3T racecar. For the Fiat 500 Abarth Venom, the boost has been turned up and a blow-off valve added, bringing the car to over 200 HP. Magneti Marelli supplies many high-tech components for the new Ferrari F12 Berlinetta. These parts include the multifunction instrument cluster with TFT display, LED rear lights, and electronic control unit with related software to control the Active Brake Cooling system. Magneti Marelli developed the world's first mass-produced full-LED headlamp for installation in the Audi R8 and is an OEM supplier to the Volkswagen Group (VAG). Gorgeous Sabelt seats in leather/suede and carbon fiber. 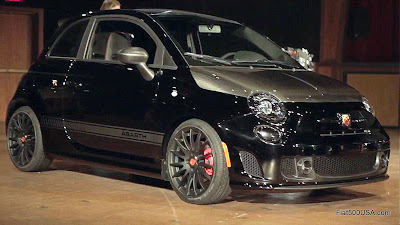 Tim Kuniskis, Head of Fiat Brand North America, had the Sabelt seats in the Fiat 500 Abarth Venom lowered a bit to give the car an even sportier feel inside. In Europe, these seats were introduced as “Abarth Corse by Sabelt” and made their debut being installed on 200 Abarth 500s used as courtesy cars by European Ferrari dealers. Difficult to tell in this photo, but the armrests have a "carbon fiber" like pattern. The Sabelt seat backs in the Fiat 500 Abarth Venom are done in an optional carbon fiber. Standard Sabelt seatbacks are made from a resin that is left in its natural color of off white. 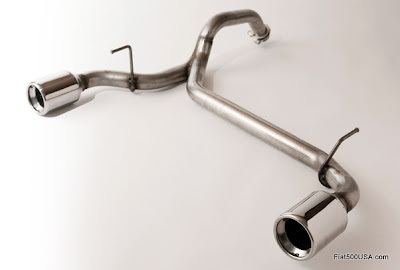 Keep an eye out for Beats Audio equipment in the 2012 Fiat 500 Abarth accessories lineup. 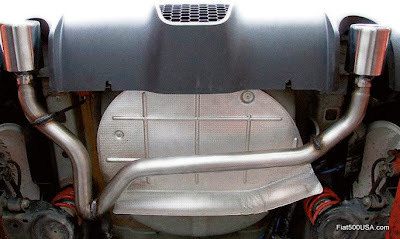 Magneti Marelli "Bombardone" exhaust installed on a Fiat 500 Abarth. 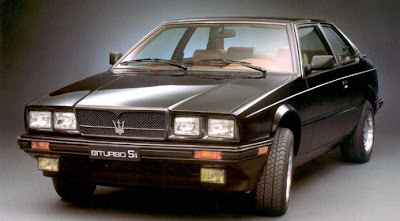 Excitement, passion and enthusiasm are what separate Italian cars from the rest of the mundane mainstream cars. 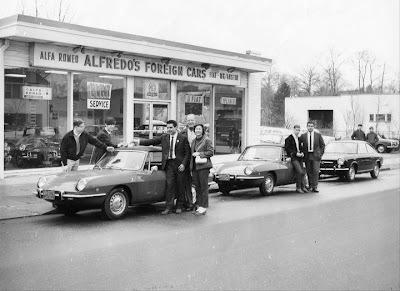 With Fiat dealers like Alfredo Gulla and FIAT of Larchmont, you are in good hands. Buying a new 2012 Fiat 500 Abarth? This is what you will first see when you get behind the wheel. 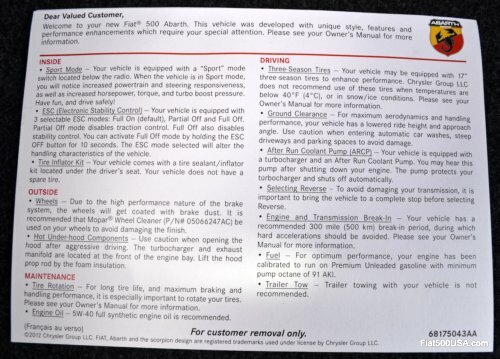 Here is the Fiat 500 Abarth owners quick information card that is hanging from the sun visor. Like it says: "Have fun, and drive safely!" A new Fiat 500 TV commercial called "Baby" will debut tonight, Thursday, March 15. The commercial features two friends and a baby going to a special event in a 2012 Fiat 500 Sport . At the end of the commercial, the baby delivers the punchline "Che cosa guardi" (what are you looking at?) to a grumpy looking older man. This new Fiat 500 TV commercial will air on local and national broadcast and cable channels. There will be two versions; one that runs 15 seconds the other 30 seconds. Keep an eye out for this commercial and the Fiat 500 Abarth Charlie Sheen commercial also airing tonight! 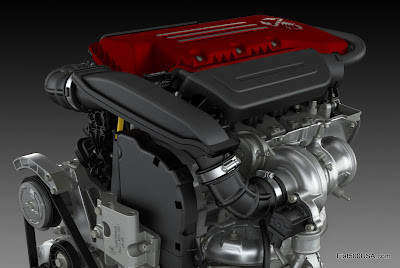 The engine in the 2012 Fiat 500 Abarth won “Best International Engine in 2010,” and was judged the single most innovative engine technology to appear in 2010. The turbocharged, twin-intercooled, 1.4L four cylinder is equipped with MultiAir technology, making it a marvel of engineering. In this video, Mike Vincent, Chief Powertrain Engineer for the Fiat 500 Abarth, highlights some of the main features of this award winning engine. 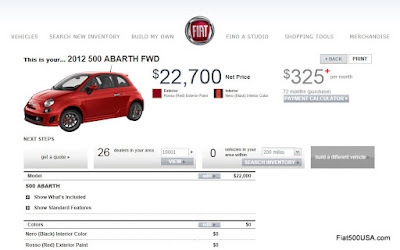 The Fiat 500 Abarth configurator has just been posted on the Fiat USA Website*. 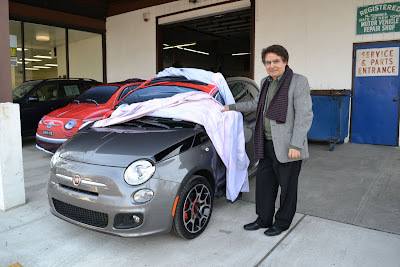 Fiat Studios began ordering the 2012 Fiat 500 Abarth Thursday, March 7 and business has been brisk! 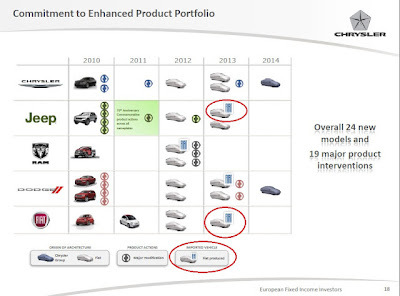 There are Fiat Studios that already have more than 100 deposits taken for the new Fiat 500 Abarth, some of these deposits were taken over a year ago. 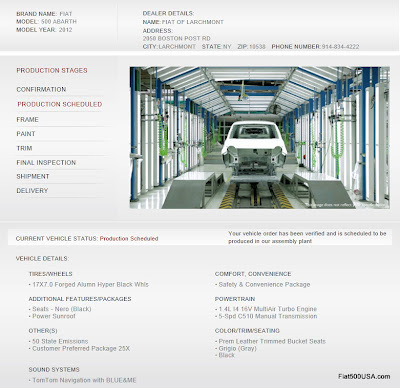 *The configurator is not 100% live, and there are some functions that still need to be added. It is probably why you are only able to access it through this link at this moment. However, it is still fun to use. Consider it a sneak peak! UPDATE: The configurator is now LIVE, so go to it!! The wait is over.... The Fiat 500 Abarth is about to hit the streets in the US and man, was it worth the wait. The Fiat 500 Abarth promises a swift kick to the pants to anyone who doubts the capabilities of this small but wicked car. In keeping with Carlo Abarth's philosophy of making the ordinary extraordinary, the Fiat 500 Abarth is truly a Giant Killer. 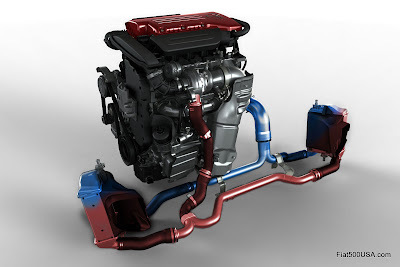 With a specific power output of 117 bhp/L, the 1.4 L MultiAir turbo sports one of the highest specific outputs in its segments beating the 114 bhp/L for the Mazda Speed 2, 113 bhp/L for the MINI S and 100 bhp/L in the VW GTI. Installing the powerful 160 HP engine into the lightweight 2,533 lbs Fiat 500 Abarth guarantees spectacular performance and hearkens back to the heydays of Abarth in the 1960s. 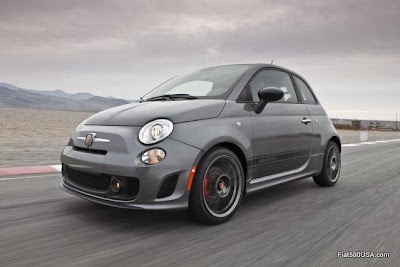 It is important to note that the US spec 2012 Fiat 500 Abarth is not the European 500 Abarth that came out in 2008, but based on the evolutionary North American Fiat 500. The US Fiat 500 Abarth starts off with a car that features an upgraded, stronger body and is smoother, quieter and more refined than than its older European counterpart, then adds the Abarth treatment. The results are a car that can be driven competitively at an all day track event and then allow you to cruise home comfortably without getting beat up. Fiat USA gathered automobile journalists from around the country and brought us over to Las Vegas to sample the much anticipated Fiat 500 Abarth. They plotted a drive through the scenic Nevada mountains leading to the Spring Mountain Motorsport Ranch racetrack for some hot laps and then a commute back to the hotel. I can say during all this driving, whether being driven harder than could ever be expected on a street, being hammered relentlessly on a racetrack or just cruising in traffic, the Fiat 500 Abarth never missed a beat. Driving out to the racetrack, Fiat laid out a course through the spectacular Red Rock Canyon National Conservation Area. These roads skirted the mountains and had turns signed at a max of 35 mph, but shhh... don't tell anyone. When the lovely lady in the Fiat 500 Abarth commercial says "You'll never forget the first time you see the Fiat 500 Abarth", for folks driving through the canyon that day she wasn't kidding, because a cyclone of Scorpions descended on the park roads. We were admonished to watch for turtle crossings and even had to sign a statement saying we wouldn't harm them, but that seems to have been the only stipulations on the whole drive because everyone took advantage of the windy roads to see what the 500 Abarth was made of. I'm happy to say I didn't see any turtles the whole day, because passing siteseers and easily doubling the speed limit before the next corner was common and put on a show for any car enthusiasts visiting the park that day. I passed a Honda Civic that was in the way and then had the driver trying to keep up, no doubt trying to read the name above the Scorpion logo on the back hatch. The roads here really highlighted the quick, well weighted steering. 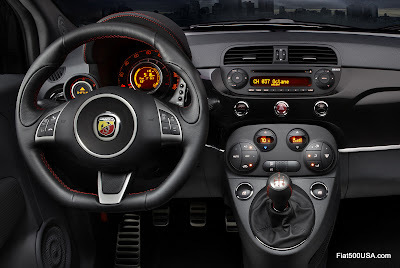 The steering ratio for the Fiat 500 Abarth is 15.1:1, which is 10 percent quicker than the standard Fiat 500's 16.3:1. Cornering is flat and understeer in spirited driving is minimal and I'd say at an ideal level to keep the car predictable and safe. Overenthusiastically hammering the car on the mountain roads led me to test out the Electronic Stability Program (ESP) in one set of corners and left me a believer in the tuning of the system. It was a bit of touch and go as I entered a left - right transition too fast for the exit turn that wound up doubling back on itself. I had to brake hard - NOW! - in the middle of the transition then make my turn in with trail braking. Lesser cars would have been caught off balance in this situation but in the Fiat 500 Abarth, this was all dispatched with just a wiggle of the steering wheel. I dialed it back somewhat out of deference to the local turtle population and the Fiat exec that was my captive passenger and concentrated on the ride, which I'm happy to say, is quite livable as a daily driver. I'd describe it as firm, yet compliant and not harsh, even with the optional 17 inch wheels. These 17 inch wheels are forged aluminum alloy for lightness and track strength and weigh in at 18.9 lbs compared to 18.3 lbs for the standard 16 inch wheels. High-performance three-season 205/40 R17 Pirelli P-Zero Nero tires compliment the larger wheels; while all-season 195/45 R16 Pirelli Cinturato P7 tires are selected as the standard size tire. Finally reaching our destination at the Spring Mountain Motorsports Ranch race track, we were greeted with a handful of Fiat 500 Abarths to sample and abuse in a race track setting. 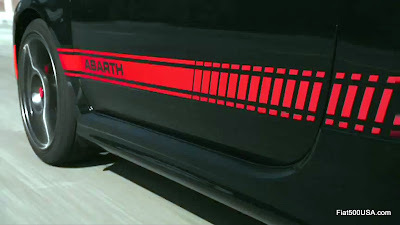 The Chrysler engineers working on the Abarth project were well aware that a car wearing the Scorpion logo must live up to the legendary Abarth reputation. Racing makes up the DNA of an Abarth and from early on, the Fiat 500 Abarth was developed so it would excel in its natural habitat. Taking a page out of Chrysler Group’s SRT brand’s durability test manual, engineers subjected Fiat 500 Abarth prototypes to 24-hour endurance events on the harsh surfaces of the Nelson Ledges Road Course in eastern Ohio. Even with a high-end performance car, many race drivers consider it a feat to finish a 24-hour endurance race without brake system, engine or suspension failures. The Abarth prototypes not only survived the challenge, but delivered dependable performance as they clocked consistent lap times from start to finish. This testing paid off, because our small contingent of Fiat 500 Abarths literally sat idling at the track all day long, waiting to be flogged mercilessly by journalists, engineers and professional race drivers. This went on all day long for 3 consecutive days, with the cars only being turned off to get filled up with gas. Driving the Fiat 500 Abarth on the track was even more impressive, as the car really comes alive. The steering offers good feedback for being electric power assist and, when combined with the chassis and considerable power, lets you balance the handling out with throttle and steering during steady state cornering. Looking at the front, the MacPherson strut (Fiat Strut?) suspension comes standard with Frequency Selective Damping (FSD) KONI® front shock absorbers replacing the traditional twin-tube design. Spring rates are increased 40 percent over the Fiat 500 Sport's and the car sits 15 mm lower. Cast ductile iron steel front control arms provide added durability during track conditions. Increased negative camber (1.5 degrees) adds to the stability and handling especially at high speeds. In the rear, FSD was evaluated but, because the 500 Abarth is lightweight and has a 64/36 front-to-rear weight distribution, the benefits of FSD was determined to be minimal. In addition, adding FSD shocks in the rear would have required a rebound travel restriction, and therefore actually reduce ride quality. 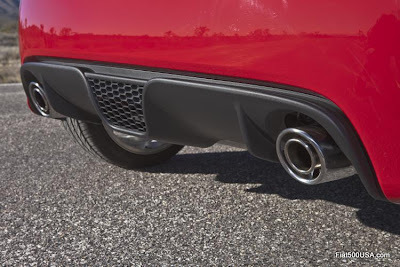 The rear axle beam uses the stiffer US Fiat 500 beam (300 percent stiffer than the European Fiat 500) and bumps it another 40 percent in torsional rigidity. The coil spring perches have been strengthened, again for track day events. A new 0.87-inch (22 mm) solid sway bar along with 15mm lower and 20 percent stiffer springs round out the suspension upgrades. For those who are curious, the differences between the US Fiat 500 Abarth and the European 500 Abarth Esseesse car is additional negative camber and a 5mm higher ride height in the North American car. The European car rides pretty much on its elastomer bump stops and the extra suspension travel in the US Fiat 500 Abarth helps make it a more dual purpose car. One that can be driven for a three hour commute every day, yet still provide a thrilling track day experience. To assist in all this and reign in the physics of a car having 64 percent of its weight over the front wheels, sophisticated electronics are on hand for those who need them. The standard Electronic Stability Program (ESP) has three settings: On, Partial On and Off. There is also Torque Transfer Control (TTC), a sub-set of the Traction Control System (TCS). When ESP is selected from “On” to “Partial Off” or “Full Off” on the instrument panel, the 500 Abarth’s innovative Torque Transfer Control (TTC) system maximizes throttle performance during on-throttle cornering. TTC is a racers friend because it keeps the front tires from going up in smoke when exiting hard out of turns, the electronics applying the brakes and increasing the torque bias in the open differential, letting the wheel with the most grip pull the car out of a turn, etc. The system is nuanced enough to recognize when some one is everyday driving and spins a wheel in the wet or is driving in a spirited way. I used the "Partial On" setting at the track and felt TTC provided just the right amount of wheel spin and traction to balance out the handling. 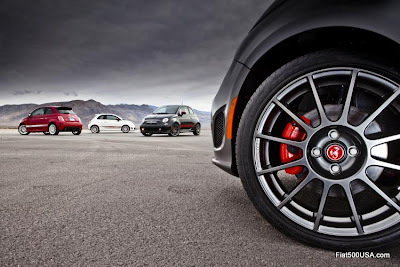 A track ready car needs track ready brakes and the Fiat 500 Abarth does not disappoint here. Larger 11.1 inch (282mm) vented front brake rotors are up one inch from the regular Fiat 500's 10.1 inch (257mm) rotors and semi-metallic pads are specified to deal with extra hard track abuse. 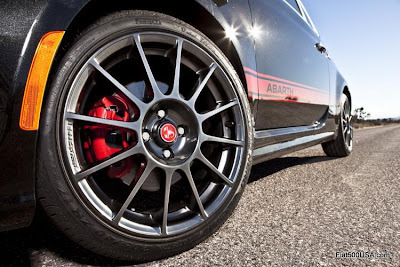 Because of the anticipated track use of the car and the fact that TTC pulses the front brakes to reign in wheel spin, the Fiat 500 Abarth was tested against and passed grueling SRT brake standards for fade, pedal feel and performance. The Fiat 500 Abarth's 1.4 L MutiAir Turbo was developed in Europe under the guidance of engineer Paolo Martinelli, current Head of Maserati Powertrain and former Head of Scuderia Ferrari F1 Engine Department. He was the man responsible for the V10-powered Ferrari F1 cars that won five Drivers' and six Constructors' Championships from 1996 to 2006. The 1.4 L MultiAir Turbo engine made its first appearance in the Alfa Romeo MiTo Quadrifoglio and was selected as the “Best International Engine in 2010,” being judged the single most innovative engine technology to appear in 2010 by a panel of 72 journalists from 36 countries. It should be noted that the MultiAir Turbo engine is currently not available in the European 500 Abarth. 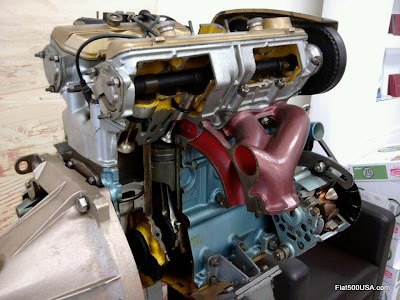 For North America, this engine had to be adapted for our market and this was entrusted into the very capable hands of Mike Vincent, an experienced Chrysler powertrain engineer. North American conditions take into account our extreme temperatures including a -40 degree cold start, our different oil availabilities and fuel make up, etc. These all had to be dealt with as well as turbo plumbing, different manifolds, engine calibrations and other detail differences. The North American Fiat 500 Abarth has a 1368 cc engine featuring twin air to air intercoolers, a larger turbocharger than the European-spec 500 Abarth IHI Turbo: the Garrett GT1446 (the same turbo unit found in the 500 Assetto Corse, 500 R3T racecars and the Abarth Grande Punto) and runs a healthy 18 psi (1.24 bar) of boost. Martinelli doesn't fool around! The cast iron block uses an aluminum bedplate for increased support of the crankshaft and reduced NVH (Noise, Vibration and Harshness). That crank is forged steel, as are the special lightweight connecting rods. The full floating, silicon aluminum alloy pistons have hard anodized piston ring lands and the skirts are Moly coated. Oil cooling jets spray the underside of the pistons to keep temperatures in check. The 16 valve cylinder head for the Fiat 500 Abarth started off as a twin cam design, but in MultiAir form, gets the intake cam tossed in favor of electro-hydraulic valve actuation. MultiAir operates directly on the intake valves and is best described as variable valve timing on steroids. Intake valve opening and lift can be infinitely varied, stroke by stroke, cylinder by cylinder. Real world gains in drivability and fun to drive characteristics, as well as fuel economy and exhaust emission improvements are realized. You can read more about this breakthrough technology here. How does all this work? Very, very well. Thank you Mr.Vincent! There is no question the power is there. Even in "normal" mode that limits the engine torque to 150 lbs-ft, passing is just a squeeze of the pedal and you are gone. Hit the "Sport" button, and you get the full 170 lbs-ft of torque from 2,600 rpm holding flat to 4,100 rpm. The power is addicting - just like driving a fast sport bike - you'll want to just roll on the throttle every chance you get to feel the the torque pull and pull. You will also want to hear the exhaust because this car does not take prisoners my friends. Accelerating hard it is bold and in your face, sounding brutal and all business. The distinctive rasp is unlike any new car you'll hear, short of a high powered muscle or super car. While cruising and with the windows up, the sound is subdued inside, but you won't do that too often because this car makes you want to play the sound again and again and again. It can turn you into quite a hooligan, as the English say. 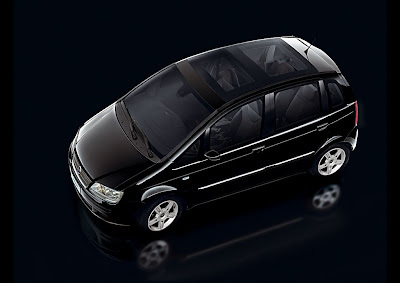 Even with all performance and attitude, the car is smooth and tractable - again in keeping with the dual purpose theme. Fuel economy is also a strong point, being rated at 28 mpg in the city / 34 mpg on the highway for a combined rating of 31 mpg. 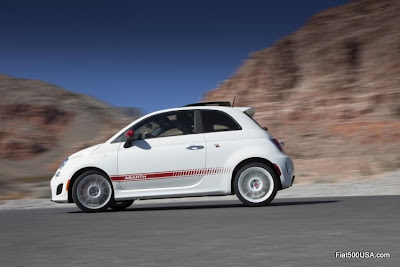 The Fiat 500 Abarth achieves the highest fuel economy ratings of any performance car sold in the US. Channeling all this power to the pavement is a reinforced drivetrain. Just as in Europe, the proven C510 heavy duty 5 speed transmission is used. This transmission has a higher torque capacity than the C514 transmission used in other Fiat 500 models. The shifter feel was a little on the rubbery side. I don't recall reading this in European road tests, so this may have been attributed to the cars being abused pre-production models. Torque steer is not an issue, as equal length driveshafts are employed. Axle shafts are 23 percent larger than the Fiat 500 (28.1mm compared to 22.8mm) and constant velocity joints are beefed up as well, enjoying a 53 percent torsional strength advantage (2600 N•m vs. 1700 N•m in the Fiat 500). This drivetrain has been well tested on racetracks throughout Europe and indeed my track time confirmed its very robust feel. I never had the feeling I was abusing the car. Just really smooth and solid. With all the time we spent on the race track you may think the Fiat 500 Abarth is too hard edged to live with, but that isn't the case. For the hour plus ride back to our hotel, I partnered up again with my Fiat exec and we took a direct route home. While some journalists explored the top speed, which I hear is about 125 mph or so, I set the cruise to 80 mph and relaxed. The stylish Abarth high back sport seats have more pronounced bolstering compared to the European 500 Abarth. I found them even more comfortable than the sport seats in my own Fiat 500 Prima Edizione. I also liked the driving position, which for me was just about ideal. The steering wheel deserves special mention, the flat bottom design is meaty and substantial and has a high quality feel to it. It is covered in leather as is the shift knob and instrument cluster cap. On the way back to the hotel, I pondered whether to give up my Fiat 500 for a new Fiat 500 Abarth. Merging onto the highway, at full boost with the twin exhausts singing their song, made up my mind. 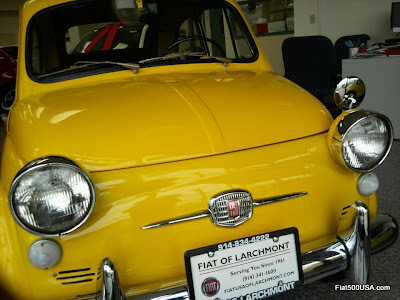 Fiat 500 Prima Edizione number 29 is for sale!